The WildEats Gourmet Gift Pack! For those loyal Wildeats followers you will recognize our cloth draw string sacks. Occupying the shelves of some of the most discriminating chef's and cooks around the country. These are folks who know and demand quality. Chef McGannon created them through years of experience, training, culinary knowledge and a solid understanding of specific food properties. 40 oz bulk containers season 150-200 lbs......a little goes a long way. Also available in a case of 15 packets. All shipping is by USPS flat rate mail. We will combine products for less shipping costs when possible. Our 3 oz. packs produce 6 quarts of our famous chili. Our goal when we developed this was to produce a balanced full flavored chili that allows the natural flavors of whatever meat you cook still have something to say about the final flavor. This is NOT your 5 alarm, blow your mouth out of the water chili. The famous Bohemian Chili Recipe is on every package and is also great used as a south western style dry rub. Try it on chicken, pork, mixed in with ground meat for tacos or add to beans for a deep rich hearty flavor. We use five different peppers and chilies to have layers of flavor to whatever you use it on. We only use the finest ingredients from around the world, including sea salt in very low quantities. 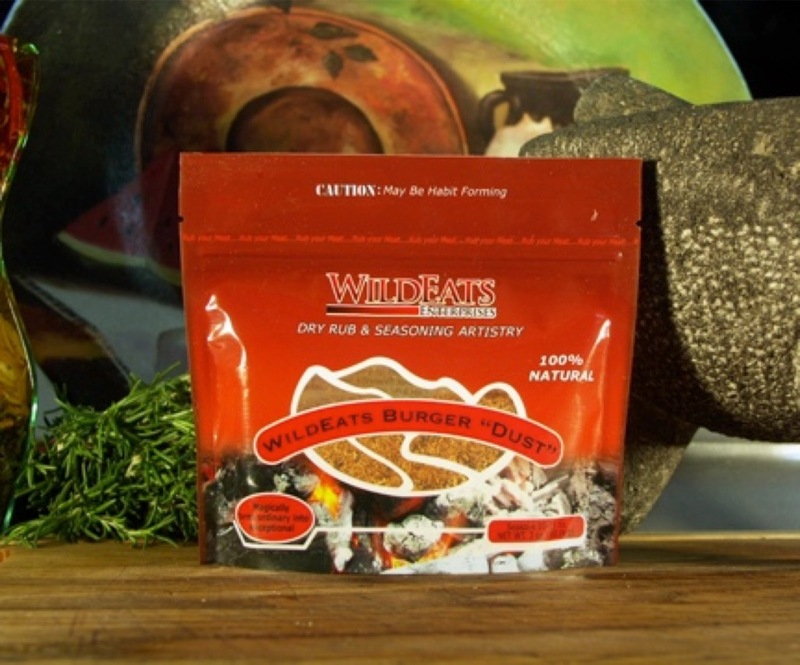 WildEats Burger "Dust" 3 oz. SSSHHH Don’t tell anyone, it will get confusing....... A blend of black & white pepper, mild smokey ancho chili, imported paprika, roasted onion, garlic, herbs and sea salt turns those backyard bbq's into memorable feasts. Let your imagination expand your boundaries. WildEats Ginger, Citrus & Pepper Rub 3 oz. Our "Ginger, Citrus and Peppercorn Rub" is a refreshing Asian and Caribbean influenced Blend. These subtle flavors bring out the best in poultry, waterfowl and upland game birds or even fish and seafood, The combination of ginger, allspice, garlic, pepper and the fragrance of citrus peel adds just enough punch to bring out a tropical flavor in whatever you use it on. WildEats Juniperberry & Peppercorn Rub 3 oz. Our eXtreme Steak and Roast Rub! The mother of ALL dry rubs... This is a robust, earthy blend that is designed to compliment the bold flavors of all full-flavored red meat. Beef, lamb, buffalo, venison, ducks and geese. Imported Italian juniper berries, tellicherry black peppercorns, herbs, sea salt and spices are used to achieve an addictive balance of flavor and complexity. Great for steaks, roasts or stews. CAUTION - May be Habit Forming! WildEats Lemon Garlic & Sage Rub 3 oz. An intoxicating blend of refreshing dried lemon peel, pungent garlic and earthy sage with a hint of cooling fennel seeds that is the perfect blend for all your poultry, pork, upland birds, and even fish. This is a terrific seasoning for home made sausage as well as a flavoring for a brine. Each package includes a special brine recipe for pork, chicken, turkey or any white fleshed meat OR simply use it as a dry rub for grilling, roasting, sautéing, add to breading for frying or toss into a sauce for that special burst of flavor. Our WildEats Rubs are as versatile as your imagination! WildEats San Francisco Seafood Rub 3 oz. San Francisco is the center of the Pacific fishing fleet as well as the culinary center of the West Coast. Our San Francisco Seafood Rub is designed to highlight all the natural goodness that comes from the sea. The subtle use of select peppers, lemon peel and coriander gives this a light Mediterranean flavor. Use on all your fish, whether you were lucky enough to catch them yourself or had to rely on the seafood section of your local supermarket. Just rub it on your fish, shrimp, scallops or lobster and cook as you normally would. Great for sautéing, grilling, broiling, baking, steaming or quick searing.